As the Industrial Division of CWA, IUE-CWA represents a force of 150,000 active and retired men and women united collectively to seek dignity on the job and a secure future for ourselves, our children and all future generations. The Division is headed by President Carl Kennebrew. Carl Kennebrew became the 8th President of IUE-CWA on August 2, 2018. Carl has been a proud member of IUE-CWA for nearly 25 years. He started his Union career as an elected delegate and Vice-President of Local 84755 in Dayton, Ohio. While Vice-President, Carl graduated from The Minority Leadership Institute (MLI), an intensive 3-week program dedicated to increasing the involvement of minorities at all levels of our union. As Vice President, Carl also worked as an organizer, served as the local’s Legislative Political Action Team Member, and as an Executive Board Member for the Dayton Miami Valley AFL-CIO. In August of 2013, Carl became the first Minority President of Local 755, the founding local of IUE-CWA. He was re-elected without opposition in the fall of 2014 and 2017. In addition, Carl served as a Recruitment Specialist for the Green Alliance for Manufacturing Skills Training in 2012, a program offering dislocated workers free training and certification in the nationally recognized Certified Production Technician (CPT). While employed by DMAX Ltd in Dayton, Ohio, Carl served for ten years as a Leadership Trainer, teaching both management and union members classes such as Diversity, Change, Communication, Team Concept, and many others. Carl obtained Life Coach Certification through Fowler Wainwright International Institute of Professional Coaching and also became a John Maxwell Certified Leadership Trainer and Mediator. 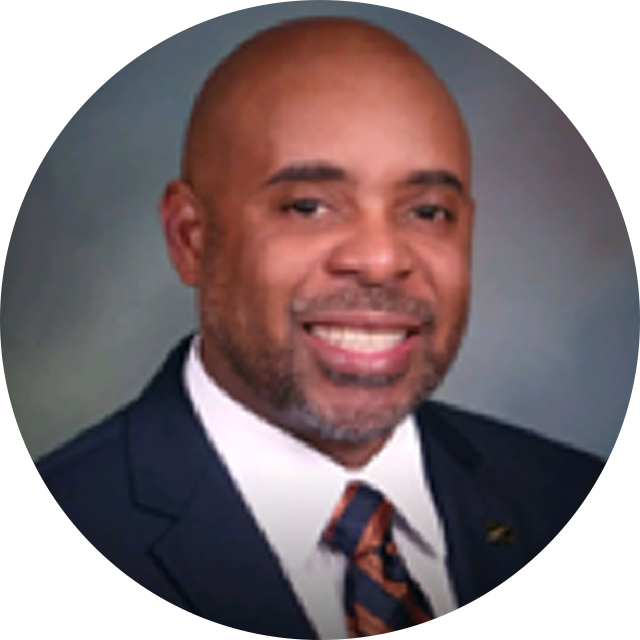 President Kennebrew is a long-time supporter of many community and partner groups such as Stand Up Ohio and the MVOC (Miami Valley Organizing Collaborative). He serves as a Board Member for The OOC (Ohio Organizing Collaborative), a Board Member of Triune Skilled Development Services, whose goal is to assist persons living in subsidy housing with finding their own self-worth and becoming positive forces within society, a a Board Member for GDUCI (The Greater Dayton Union Co-op Initiative), a Board Member for The United Way of the Greater Dayton Area, and a Dayton Metro Library Board of Trustee. Additionally, Carl was ordained last year as a Minster for Revival Center Ministries. In 2017, Carl was recognized one of the Top Ten African American Males in the Miami Valley. Additionally, Carl has also received the Staircase to Excellence Award, the United Way Volunteer of The Year Award, and Dayton’s Men of Influence award. President Kennebrew resides in Dayton, Ohio with his wife, Shamica. World War II was over. The Cold War was just heating up. And into these heady times–times of prosperity and paranoia–was born a new, militant union. “IUE-CIO was born at the CIO’s Eleventh Constitutional Convention in Cleveland on November 2, 1949. We were born literally without any membership or treasury–with nothing except the loyalty and militancy of tens of thousands of electrical workers who had fought with us for years for the kind of democratic unionism and genuine collective bargaining which Communist leadership had denied them,” described IUE founder James B. Carey. From those humble beginnings, a great industrial union was created. Dubbed a “union in a hurry” by CIO President Philip Murray, IUE grew from no members to more than 300,000 in three years. Much of the growth came as the IUE and its predecessor, the United Electrical Radio and Machine Workers of America, battled head to head in bitter representation showdowns at General Electric, Westinghouse, Sylvania, RCA, Sperry and other plants across the country. Murray had expelled the UE from the CIO over fears about Communist influence among its leadership. 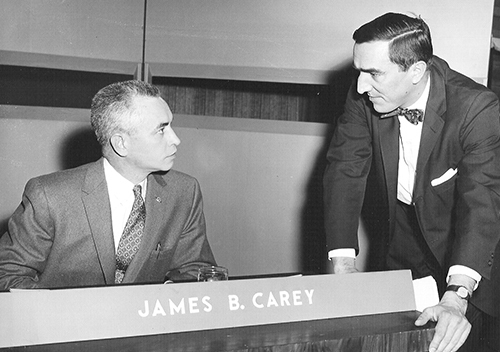 Within a year after its founding convention in Philadelphia, IUE had adopted its first constitution, elected Carey president, defeated UE in several key elections and negotiated successful national contracts with General Motors, GE, and Westinghouse. In one day in 1950, 25,000 General Motors Workers in five local unions chose IUE over UE. By the mid-1950s, IUE had emerged as the dominant industrial union representing workers in the electrical-electronics manufacturing sector. IUE was, indeed, hurrying to make its mark on the labor movement. 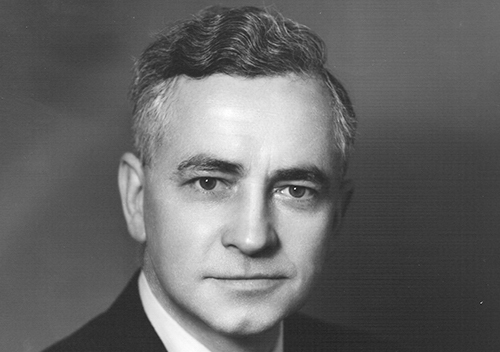 IUE founding father Jim Carey, the so-called “boy wonder” of the labor movement. Celebrating Carey’s election as IUE president at the 1950 convention in Milwaukee. The campaign in Dayton for a General Motors plant focuses on the benefits an IUE contract has always stood for. Dues payments were always an issue. Here, the argument is made at the 1950 convention. Though dedicated to achieving stable labor-management relations through collective bargaining, IUE has never cowered from hitting the streets when needed. 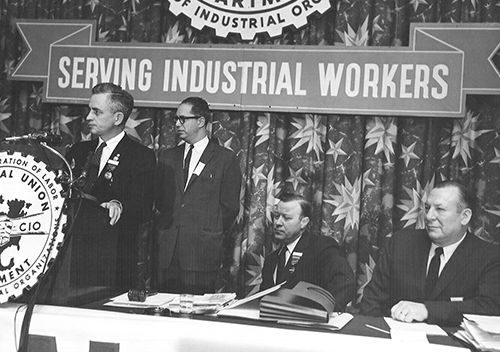 In its 50-year history, IUE has waged three strikes of national significance: Westinghouse in 1955-56 and the strikes against General Electric in 1960 and 1969. The 156-day Westinghouse strike–one of the longest national strikes in labor history–idled 55,000 members and closed down 35 plants from coast to coast. 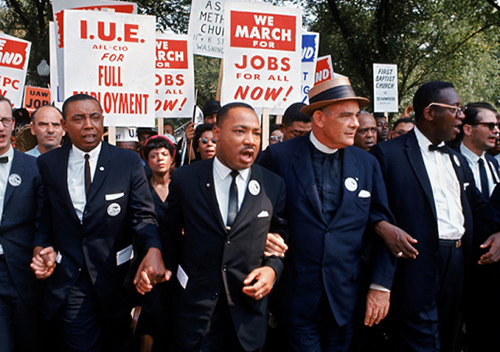 The highly divisive GE strike of 1960 lasted nearly three weeks and involved 70,000 members. The 101-day 1969 strike was the final nail in the coffin for GE’s “take it or leave it” bargaining strategy, otherwise known as Boulwarism after GE negotiator Lemuel Boulware. IUE members march on jobs for all. 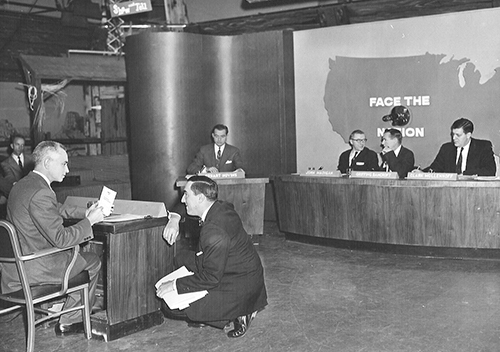 James Carey on Face the Nation. A 1960 booklet exposing GE’s propaganda is the forerunner of today’s corporate campaigns. 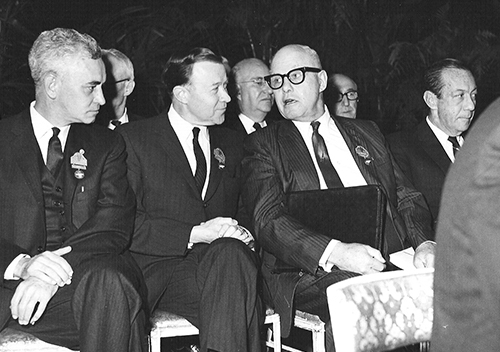 Carey also attended and spoke against GE policies at the company’s shareholders meetings — a novel idea at the time. IUE has pursued an aggressive political agenda on behalf of its membership. Through the years, IUE has orchestrated lobbying on behalf of civil rights and anti-poverty programs, equal employment opportunity, fair housing, education, national health care, pay equity, and trade reform. It also has been active in raising funds to help pro-worker candidates win office at local state and national levels. IUE is committed to giving workers a strong and vocal voice in the political process. 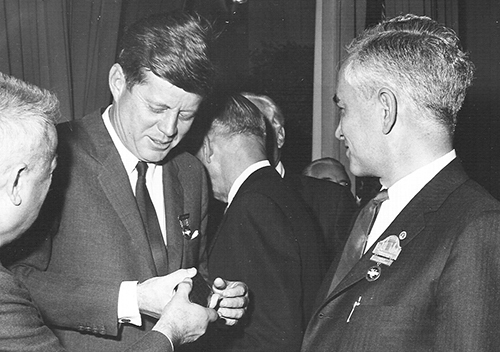 Prominent politicians like Presidents JFK and Harry Truman have addressed IUE conventions. Truman maintained close ties with IUE founder James Carey even after leaving the White House. 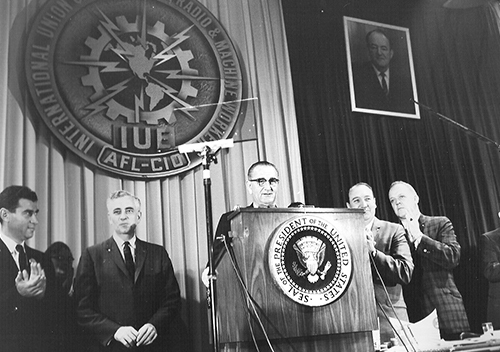 President Lyndon B. Johnson addresses IUE’s 11th Constitutional Convention. 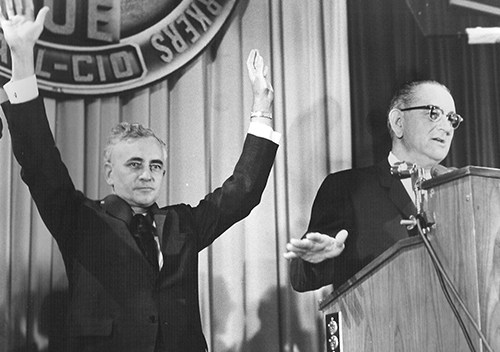 He used the IUE stage to advance his Great Society Program, which was strongly endorsed by members attending the convention. 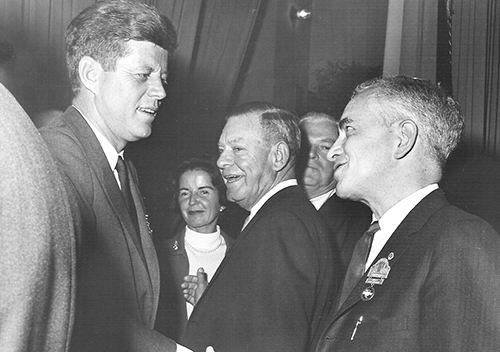 President John F. Kennedy greets IUE members at the White House during a break from an IUE Full Citizenship Conference. 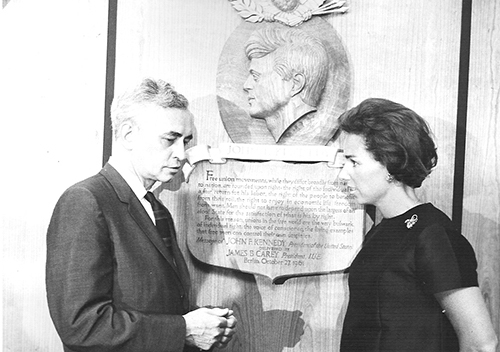 Kennedy promoted his civil rights agenda to the receptive crowd. Women have always played a prominent role in IUE’s history. Early on, IUE established a Women’s Council to promote the advancement of women on the job. IUE also has led the fight for pay equity and against pregnancy discrimination. Follow these links for even more resources.